If anyone knows how to celebrate St. Patrick’s Day in style, it has to be GUINNESS®! The merry people at Guinness Anchor Berhad (GAB) recently threw a St. Patrick’s Festival Media Launch on March 1st with the theme…Merry Goes Around in March! 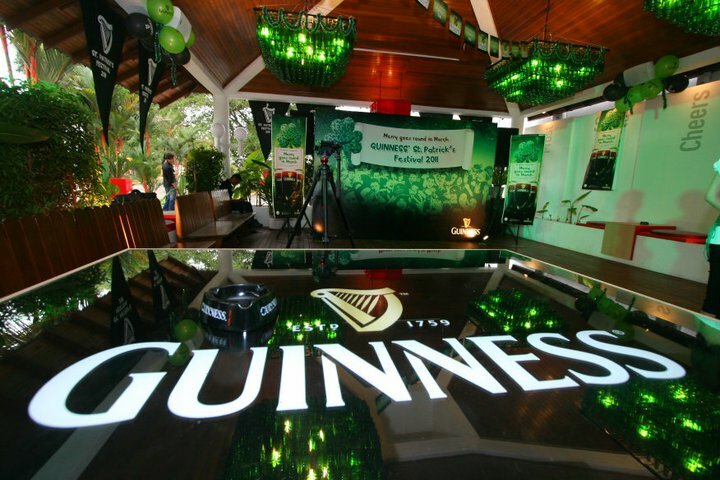 The festive celebrations and promotions from GUINNESS® go on from March 1st 2011 to March 31st 2011. Street parties, fun activities and a host of exciting promotions will be held nationwide by the merry GAB team in conjunction with St. Patrick’s Day for the whole month of March. “For the entire month, GUINNESS® St. Patrick’s celebrations aim to share the true spirit and essence of the St. Patrick’s festival that is globally synonymous with GUINNESS®. Instead of just celebrating it for a day, we at GUINNESS® are bringing St. Patrick’s fun all throughout March to put bright spots in the daily grind of our consumers. 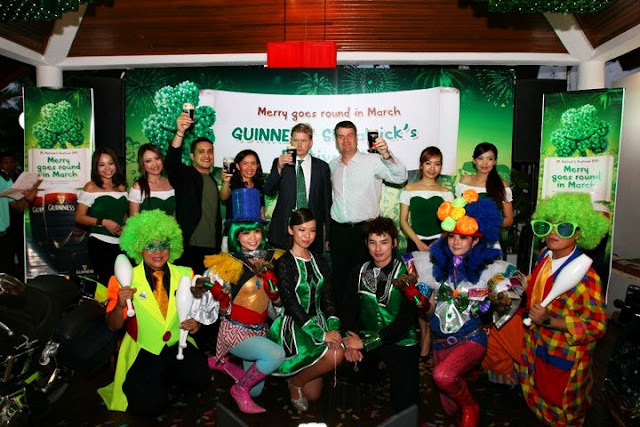 Keep a look out for our entertaining festivities as well as consumer promotions that make everyday a St. Patrick’s Day!” said Ms. Yap Swee Leng, Marketing Director of Guinness Anchor Berhad. The media launch was held at GAB, The Tavern. Everything was green and ready for a good time! The Party started off with a speech by Ms. Yap Swee Leng, Marketing Director of GAB and followed by a parade of entertainers and bikers marching into The Tavern. This was followed by a cake cutting session by Marketing Director of Guinness Anchor Berhad (GAB); Mr. Shane Stephens, Deputy Head of Mission of the Embassy of Ireland, and Charles Ireland, Managing Director of Guinness Anchor Berhad. 'The Tavern' shaped from rows of bottles. Simply outstanding! I love the magnificent chandeliers made from green bottles! Entertainers, dancers and lots of pretty girls all dressed in green! The Green Man of the night! The amazing buffet spread of the night! People went several rounds for the scrumptious spread. Super icy slurpee of Kiwi and Mint mocktail was slurpee-licious! Huge Prawn Skewers was hot and crispy! Beef Roulade was just delicious to boot! What is a beer party without Spicy Buffalo Wings? Guinness Chocolate Cake was heavenly bittersweet! Icy cool Cream Puff with Custard and green Chocolate! White Chocolate Mousse with French Macarons was another luscious dessert! Check out the Guinness Cake made by BigBoysOven. Age-old Irish quote ‘ol,ceol,craic’ (a great pint, good music and wonderful fun) certainly summed up this great event. Here’s one for GUINNESS®! wow it was such a memoriable nite, well done to Guinness ! Ken: Got ah.. in the white chocolate mousse.. else get Sunny to make you some! BBO: yeah, it was an awesome night, thks to you & GAB!